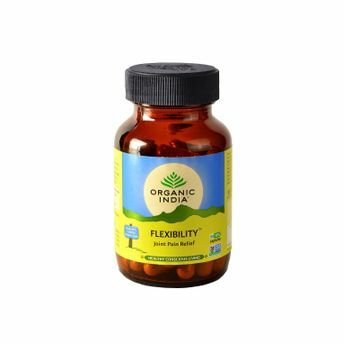 Flexibility lubricates, protects and repairs joints and tissues, reduces inflammation, improves joint mobility and soothes muscle spasm. Relieves pain and reduces need for pain killers. Flexibility gives lasting relief from stiffness and inhibits degeneration of joints. Improves grip strength in rheumatoid arthritis. Safe for long-term use. For best results take with Organic India Osteoseal, a natural calcium and vitamin supplement.